It is impossible to overestimate the effect of the Russian Revolution on the course of world history. 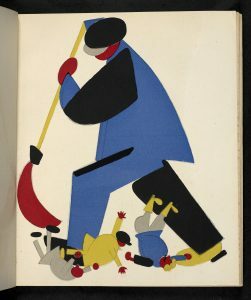 Russian Revolution: Hope, Tragedy, Myths, the British Library’s new exhibition, covers from Tsar Nicholas II’s coronation in 1896 to the death of Lenin in 1924. In less than thirty years, the Russian Empire underwent strikes and uprisings; the catastrophe of World War I; the October Revolution of 1917 when the Bolsheviks formed a government; the tsar’s abdication and subsequent murder; Civil War on a massive scale as Russians fought each other – some for independence, some for the Bolsheviks, some for the tsar – when over 10 million people died and 2 million emigrated; another 5 million died from starvation as grain was forcibly requisitioned; the creation of the Soviet Union in 1920, and Lenin’s death and subsequent apotheosis. 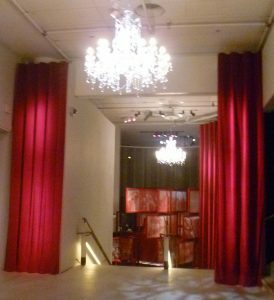 The dramatic entrance to the exhibition deliberately mixes the old order (the chandelier) with the new, as symbolized by the red curtains and the hanging red-bordered contemporary Revolutionary posters from the British Library’s collection. The exhibition opens in 1896 with a photo of Nicholas II in 17th century dress for his coronation. And there are reminders of how closely-related the royal families of Europe were. 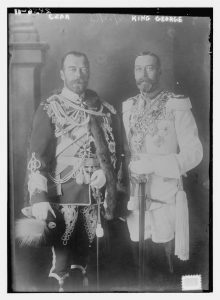 Nicholas II and George V, for example, were first cousins (their mothers were sisters). Kaiser Wilhelm II was another first cousin. But the exhibition’s concentration is mainly on how ordinary people were affected by the cataclysm. In 1913, only 15% of the population was urban; millions of illiterate peasants laboured under a heavy burden of taxes and other obligations. 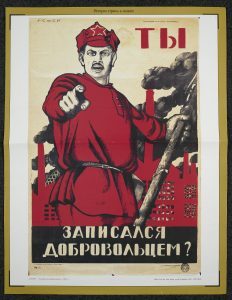 Red Army poster, 1920: Have you Volunteered Yet? In this recruitment poster, a Red Army soldier stands in a Lord Kitchener-like pose. Note that he is an ordinary soldier. This is a call to arms for the proletariat to rise up and fight for a new world. The shoes above are a haunting reminder that millions of peasants would die of starvation in the ensuing conflict. 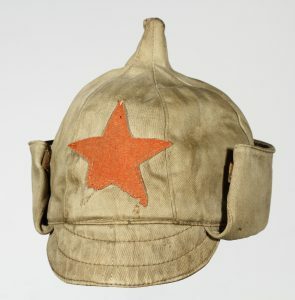 It is humble objects like these which pack a real emotional punch: we cannot forget that the Russian Revolution signalled not only a brave new world, but also unbelievable suffering, famine and death for millions of ordinary people. 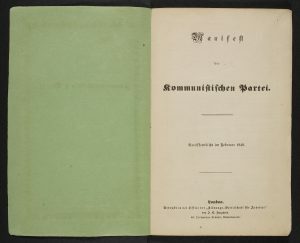 This extremely rare copy is a reminder that Lenin, one of the founding members of the Bolshevik Socialist Government after the October revolution of 1917, knew Karl Marx well when they were both in exile in London. And the exhibition also has Lenin’s application for a ticket for the British Museum Reading Room – which was granted. The revolutionaries didn’t have it all their own way. 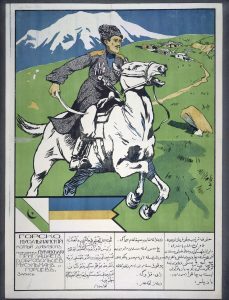 The White Army, fighting for the monarchists in the Civil War, had their own posters. Note the noble-looking Cossack on his white horse galloping to the rescue. He’s certainly no peasant! The White Army could be just as hard-hitting about the Communists. 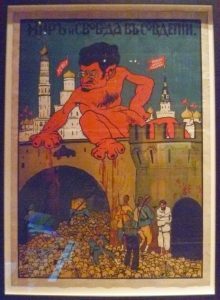 Above, Trotsky bestrides the walls of the Kremlin in the guise of a red devil. Below him, huddled prisoners stand on a huge pile of skulls – a reminder of the millions who were to perish as the Bolsheviks tightened their hold. The Reds fought back with their own propaganda. This lively placard dates from 1917-1922. Its colourful simplicity reflects the fact that most of the population were illiterate. The Bolskeviks had a huge job on their hands, not only in convincing the peasants to rise up and fight for this new system of government, but in finding ways to get across their beliefs to people who couldn’t read. This was when early news reels came into their own – I particularly enjoyed the small boy who kept darting in front of the camera and waving. There are also clips from Eisenstein’s Battleship Potemkin, and contemporary photographs. The early revolutionary years were a time of extraordinary creative productivity in the arts. Prisoner’s leg irons from the Gulag. Millions perished here. The exhibition also looks at how other countries reacted to the Russian cataclysm. Some governments congratulated the new liberal regime; others worried how it would affect the course of the Great War, and how the revolutionary Bolshevik agenda might affect political aspirations in their own countries. The exhibition is open until 29th August, 2017. I thought it was fantastic: interesting, enjoyable, thought-provoking, and horrifying, and it leaves you with much to think about. It is inevitable that in this year there will be several exhibitions commemorating the Russian Revolution. Did you visit the show at the Royal Academy “Russia: Art & Revolution 10917-32”? Thank you for dropping by, Pauline. Yes, I did indeed see the RA exhibition. Interesting – and terrifying, especially the section on the awful fate of so many of the Russian artists. The British Library exhibition is a different animal. It’s not about the art, though some of the exhibits are artistically interesting, like the posters, it’s more about the wider story: the history of how a nation changed over a momentous period, the aspirations of ordinary people, and the myths that were created. Lenin’s death was treated as a sort of religious apotheosis with images of him almost like the risen Christ.